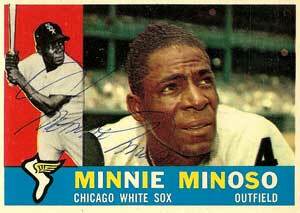 Nearing his 90th birthday, Minnie Minoso is still bouncing around Chicago as an ambassador for the White Sox, displaying the vigor that allowed him to play professional baseball in seven different decades. Tom Weinberg, director of the Mediaburn video archive, has given Minoso his just due by producing a documentary, "Baseball's Been Very, Very Good To Me: The Minnie Minoso Story." Click here to read a review from LatinoSports.com of the documentary which is still awaiting its proper national distribution. It is a fitting tribute to one of baseball's overlooked pioneers. As a small Kickstarter investor in this project, I'm biased but this is a great effort and every baseball fan should see it.